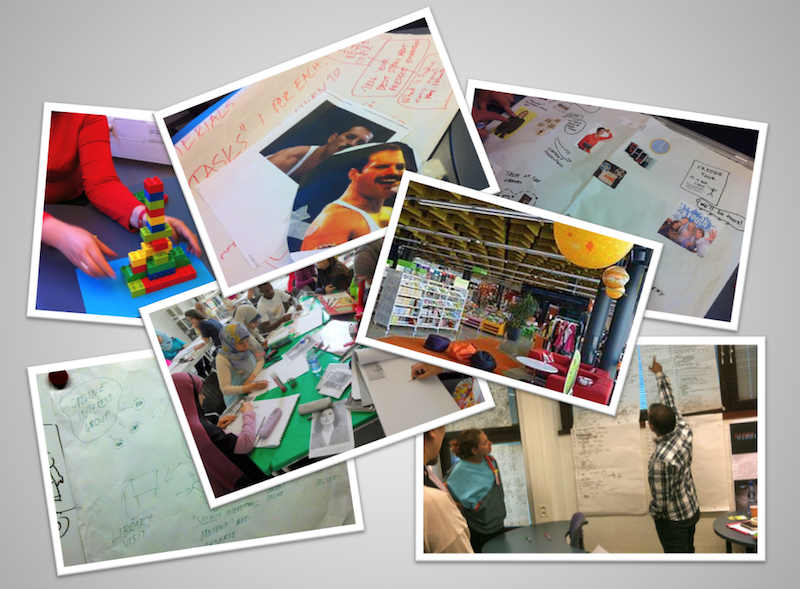 We formed one of the teams in the Design thinking course fall 2012, led by Mariana Salgado and Sanna Marttila. During the course we were introduced to the main ideas and philosophy of design thinking, ways of seeing and understanding design as well as with various methods, project and cases from the multifaceted field of design. We also got an opportunity to familiarize and test different design methods and tools in practise, by utilizing them to develop new service ideas for museums and libraries. Our team developed a preliminary service concept for libraries, by combining enhanced utilization of social networks and internet services and organizing guided, thematic tours. From the following chapters you can read about our experiences from different design phases and methods. During our first contact lecture on 7th of September, our lecturers Mariana Salgado and Sanna Marttila organised the entire class into different teams and proposed three different service themes: services for libraries, services for archives and services for museums. Each team was asked to choose a theme and our group decided on the library theme because we make use of library services more often in our study programme than the other themes. Any potential library customer can make suggestions on interesting topics for organized tours. Based on the interest that raises, the librarian can take the idea into further development. The librarian can organize the tour by herself or by recruiting a topic area specialist. The actual, physical Guided Path tour is organized in the library premises, during which the customers get a rich introduction on the variety of materials the library has on the chosen topic. During the tour the customers can mark the materials they find most interesting (using e.g. their mobile devices and RFID tagging). Afterwards the tour can be re-experienced online. The participant can see all the presented materials on a tour map, as well as the materials she especially marked up. The customer is also suggested on check some other potentially interesting materials and the online experience involves also discussions on the topic. The customer can choose the materials she would like to get and place an order for them online. The materials can be delivered to her home or to a pick-up point nearby. To understand the usage of libraries from both visitors’ and staff members’ perspective we tried out some empathic research methods which fall under the umbrella of ethnographic methods. The aim was to gain understanding on current library services and inspiration for service ideation, and to get feedback to our preliminary Guided Path concept idea. The methods we used were in situ observations, visual ethnography, so called “virtual ethnography” (meaning information gathering through available internet sources), and interviews with library staff and visitors. To gain a broad understanding of library services we chose different types of libraries from the Helsinki metropolitan area (Kaisa-talo, Helsinki University Main Library, Sello and Entresse mall libraries, Aalto Business Library, and Oulunkylä Library), Lappeenranta main city library and Misr Public Library in Cairo, Egypt. The knowledge and experience gathered through these methods proved beneficial when we continued working on the preliminary concept idea. The interviews with library staff revealed that something similar had already been tried out in many of these libraries and this gave us confidence and new ideas for further development of the concept. Segelström, F., Raijmakers, B. & Holmlid, S. Thinking and Doing Ethnography in Service Design. 2009. To be able to achieve this we needed to have a common understanding of idea of the service in question. So we started talking. At this point, based on the field research, we already had good understanding about the library as a space and what kind of services it already provides. By focusing on the value adding factors in this particular case we were able to construct a solid idea of a customer journey. Our group had much more ideas that we were able to fit in. We tried to talk through advantages each idea would bring to the service. One driver was to keep it as simple as possible. This meant that we needed the nerve to choose the suitable ideas and leave a lot of good ideas for future development. A scenario is a realistic description of how a service works. A persona is a realistic description of a type of service user. Imagine a 25 year old member of online community who learns about the Guided Path service in the local library on the subject that he is interested in. What things and people need to be there, and how they are arranged? What happens in the scenario? 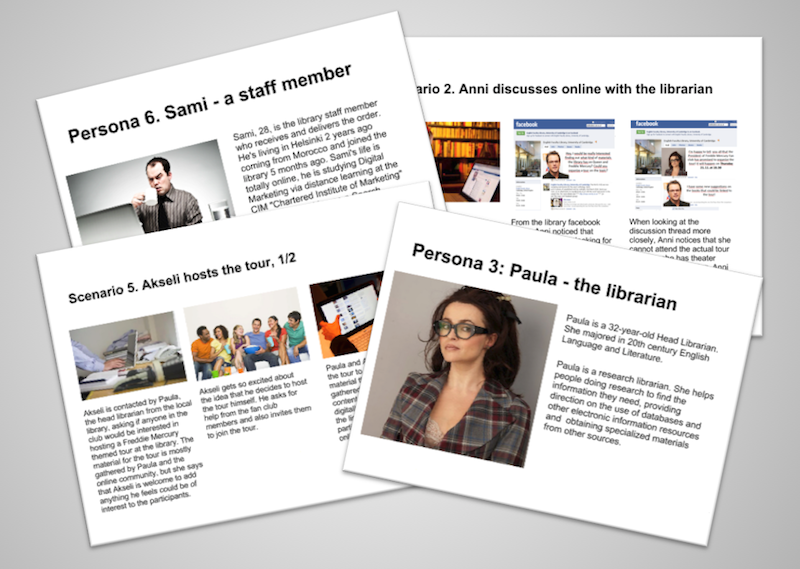 Scenarios and personas work best when based on realistic portrayals, as in the example given. To create the scenario for the Guided Path service, we simply listed the elements of each scene, including anything that contributes to the overall experience. We started by giving the person a name and then brought them to life by listing their demographic qualities (age, gender, education). We developed a brief story about how things would normally work. We tried to be consistent with the scenario and personas and not “change the rules” halfway. Our sessions were relaxed and fun. We encouraged experimenting and playing with different options. Carroll, J.M., Ed. Scenario-based design: Envisioning work and technology in system development. John Wiley and Sons, New York, 1995. After creating the different set of scenarios for our Guided Path we moved to a new stage of developing some critical artefacts, “tools for opening up the design space”, and choosing one of them to be presented using a role play. We thought of some critical artefacts and our main objective was to find an idea that challenges our assumptions and broadens the space of possibilities. We came up with an audio guidance idea that when one of the guided path group is in the library the materials that the user is looking for call him with voice like “come on, I’m here”. We developed the idea to a musical form: when the user is getting close to the material the volume goes up and when the user moves away the volume goes down. We used another critical artifact which is the engagement of the visitor. When the user finds the material a question appears on their mobile to get more information about the topic of interest. We presented this idea in a very interesting and exciting silent role play. “Critical Artefacts and participatory innovation” by Simon Bowen. In addition to the exercises with different design methods to develop the concept ideas, we were introduced with additional exercises to train our creative minds, to gain insight to our own thinking processes and communication. We started the course with 100 lines exercise, where the idea is literally to draw 100 lines and give each one of them a name. The exercise can help you to understand your own thinking and working processes. It can also provide very interesting and even surprising insights on how you may experience and and recover from ”creative blocks”. The idea of the Silent game on the other hand was to build ”something” with legos, in three persons teams, silently. The basic idea is that the ”master designer” starts to build something, the ”assistant” tries to understand and build upon the masters plan and the ”observer” makes notes and tries to make interpretations on what happens. After the exercise the process, impressions and reasoning of events is discussed. The exercise provides very interesting insights e.g. into how very differently people in teams can both rationalise and interpret things. Would recommend you to give both of these exercises a try! This course gave us glance on different tools and methods that can be used in different projects, as well as inspiration to look for more in-depth knowledge. For many it evoked an desire to be able to take part in workshops focusing on selected methods, concepting and prototyping. Most importantly, the course challenged us for the “designerly way of thinking” to “embrace the unknown” to try, make mistakes and try again, in order to look for more, better solutions. From the following links you can find additional information on Design Thinking and exercises to train your inner designer. Great work! I just loved the visualizations your team had in the course. Especially the drama: ). This course really woke up the inner designer ready to try, make mistakes and try again. Your group work has been from the beginning until the end coherent and innovative process and it has been a pleasure to follow that. I really liked your last performance, the acting part, it did summarize the concept as an actual service. Thanks for sharing this to us! Interesting to read details how you built up your new idea and innovation for a new service. The “silent role play” was special to me and I can see the whole class enjoyed it too! Good team and good work, well done! Thank you! Very detailed post that puts the whole course in a package. Also it gave me more understanding on yout concept and I started to believe that there could be users for these kind of services. Well done! I really liked your development idea and think that it could bring a lot of new customers to libraries. The traditional service concept is the core of libraries but adding this kind of cultural experience wouldn’t do any harm. I would be more than happy to participate in the Guided Path! This blog post is very structured and giving the detailed information about what have we done during the course. What I liked the most is the end of your post. “Embrace the unknown” to try, make mistakes and try again, in order to look for more, better solutions. This is very important sentence. Kristian Segerstråle, eVP, Digital of EA told on Slush 2012 that “to build something really good, you first need to fail as soon as possible” so you will not make the same mistakes again. I love that sentence and it became my motto. I hope our “Design Thinking” journey in Laurea gave us straights and tools to make our designs better and better! Wonderful to find so many interesting details of your group work here. I especially liked how carefully you had designed both your characters and their customer journeys. Your critical artefact dramatization was also truly memorable. I would love to participate in an event like that in a library. As Daniel I think you nailed the ending. Failing also shows where there is a fault that can be improved, That determination and some Gary Hamel’s Leading the Revolution attitude and you’ll be alright. Nice work, thank you for the blog post! It would be interesting to learn more about concepts similar to yours that the libraries in question have tried out. You said something really nice: “…to try, make mistakes and try again, in order to look for , better solutions…” And I completely agree with that. In order to find better solutions the phase of concept is the best moment to try and fail. Some weeks ago I watch a speech from Kristian Segerstråle, at Slush event, and one of his advices about successful business was to fail quickly and recovered fast. Thank you for well prepared blog post. You can read between the lines that you group was really enjoying while doing this group work.